Ferrybridge C Power Station was situated on the River Aire near Ferrybridge in West Yorkshire, England. 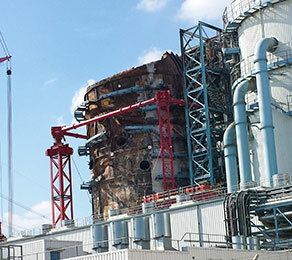 Two of the four units at Ferrybridge C were fitted with flue-gas desulphurisation (FGD) plants. In July 2014 the power station suffered a major fire to one of its two FGD plants. To enable the controlled demolition process, bespoke cranage and lifting equipment was designed and installed by the main contractor, J Bryan (Victoria) Ltd. Due to uneven substrate, the engineers working on the project were concerned deflections and movement could occur when the cranes were loaded. CCL was commissioned to devise a solution to provide void-free, stable sub-bases suitable for heavy loading and ensure that each crane/anchor base was able to withstand a minimum of 200 tonnes of crane weight. The company came up with a solution which involved injecting high-strength epoxy resins and easy-flow, cement-based grouts into the voids beneath the bases. This ensured uniform load transference and distribution whilst providing a stable loading base. The project was completed successfully despite difficulties accessing work areas within the fire-damaged structure.